Alan Potts' decision to appoint Irish rider Robbie Power as his retained rider has paid handsome dividends at this year's Randox Health Grand National Festival, as the owner, jockey and trainer Colin Tizzard, recorded their third Grade One victory of the meeting in these colours, courtesy of 3/1 favourite Finian's Oscar's game success here. Always travelling comfortably throughout the extended three mile contest, the five-year-old son of Oscar made stealthy headway to challenge for the lead in the home straight, and after winging the final hurdle, stayed on strongly to score by three lengths. Dan Skelton's Captain Forez stayed on well to finish second, with a further three and a quarter-lengths back to Messire Des Obeaux in third. Pingshou (G1 Crabbie's Top Novices Hurdle) and Fox Norton (G1 JLT Melling Chase) were successful for Potts yesterday and he said: "Cheltenham was fantastic and then we have come straight here and it is the same. "In fairness, it's how we spend our money, it isn't how we earn it - we are engineers. We live a fairly quiet life on our farm apart from when we go racing." Potts appointed Power after they teamed up to win the Timico Cheltenham Gold Cup with Sizing John at last month's Cheltenham Festival and Potts was evidently delighted with how things have panned out at Aintree. He continued: "He [Power] is absolutely brilliant. We're delighted with him. He thinks he has died and gone to heaven. 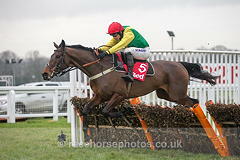 We are also very happy with Colin Tizzard and Jessica [Harrington, Sizing John's trainer]." Trainer Dan Skelton was delighted with the performance of Captain Forez, who finished the three-length runner-up this afternoon. The 14/1 shot was nursed into the race by jockey Harry Skelton and the pair stayed on strongly to claim second after the last. Skelton revealed that he purposely hadn't been hard on Captain Forez this season and that the best was yet to come from the five-year-old, who has yet to win a race. "The trip really helped him," said the trainer. "Next year we'll go for a little novice hurdle and then Graded races all the way through. We might even end up going to the Cheltenham Festival and then back here. He'll then be a chaser in time. We've looked after him this year - we've not slung it all at him. "We've allowed him time to become the best horse he can be and he's still a work in progress. He jumped great, apart from one where he was a bit 50/50 at it, and this is why I want another year hurdling with him. I want him to know everything he can about the job, so then we're a healthy novice chaser. "We've got a plan for him and, with a bit of luck, it will all come off." Messire Des Obeaux finished third behind Finian's Oscar and Captain Forez at odds of 7/2. He was six and a quarter lengths behind the winner. The five-year-old, who won the Grade One Betfred Challow Hurdle at Newbury on New Year's Eve, is trained by Alan King and ridden by Daryl Jacob. King said: "We're happy enough. I thought, looking in the paddock, that they were the nicest bunch of horses I've seen in a race for a long time; serious quality. This was a top-class race and he's run very well. "That will be him finished now for the season and he'll go chasing in the autumn."